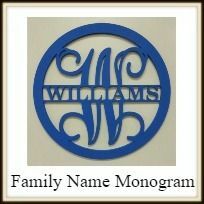 Our Circle Frame Family Name craft projects are custom cut in-house! This DIY craft product comes unfinished. All products ship within 2 to 7 business days. Our unfinished wood cut-outs are crafted of a high quality cabinet grade MDF. All products are cut in-house on our CNC routers and are hand-sanded, smooth to the touch. We recommend using an acrylic paint on our unfinished products. These paints can be bought at Wal-Mart, Home Depot, Hobby Lobby and other stores. All products cut on 1/4" MDF are moisture resistant and suitable for outdoors. We love taking custom orders! Any sign or logo can be custom made for your business or home. Call 1-855-992-7677 or email support@Build-A-Cross.com for more information! Thank You for your interest in our unfinished wooden cutouts! Arrived in good packaging. The quality was excellent, nice size and thickness! I can't wait to give it to my friend, and see how beautiful it is after Annie Sloan chalk paint! Highly recommend, excellent as a gift or for your own home! Bought this for someone who did something for me, when I gave this to them they were so excited....thanks for making their day. Bought this for over my daughters bed, her name and initial . She loved it, hardest part was deciding on a color to paint it. Love my purchase! Wish there would have been an option to have it painted for me, but the quality is great! Ordered it for my parents for Christmas. Probably ordering one for our house as well. Shipped fast and received great product! Will definitely recommend! This product exceeded my expectations. Quality made, inexpensive gift. Just paint it and your good to go. You know your getting quality products when the shipping package was awesome. This product turned out better than I expected. I am completely happy with it. Super affordable. It shipped so fast too. Highly recommend this vendor and this item. I saved them in my "favorites" folder. Beautiful!!! Just a little sanding and some paint and a bow and you have a unique gift that everone loves!! Ordered for a gift and was so excited to receive a well made product that I am happy to give.